The founding of the Bay City Boating and Fishing Club (now Saginaw Bay Yacht Club) was sparked by an invitation to prospective members to attend an organizational meeting on September 18, 1894 at the Fraser House. (The Fraser House was Bay City’s major hotel at the time). The committee listed on the invitation included I. W. Snyder, C. Gregory, L. M. Bradley, C. H. Ueberroth, I C. Thompson, and was headed by Wm. P. Jennison, who was the moving spirit in this venture. 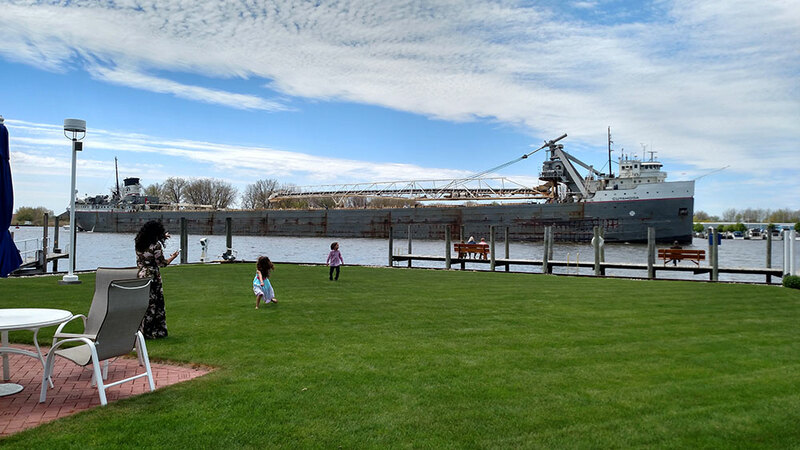 The enthusiastic reception resulted in enlisting 109 charter members and construction of the first clubhouse located on the Saginaw River at the foot of Scheurmann Street in Essexville. In 1898 the Michigan Sugar factory was constructed at Woodside and Scheurmann near the clubhouse. The following year the Bay City Sugar Company located a facility across the street from Michigan Sugar. We can only imagine the noise and odors penetrating the Club’s backyard. In addition the small clubhouse at the foot of Scheurmann was being rapidly outgrown because of increased activity. There was a lack of mooring places, which along with the encroachment of the sugar factories and the inherent noise pollution and odors created an urgency to move the club. A meeting of the membership was called and the directors received a unanimous approval to proceed with plans, provided that membership could be increased to 150. This goal was quickly reached by an enthusiastic membership committee. Luckily, an ideal parcel of land with 480 feet frontage on the river and 170 feet deep just a half mile from the mouth of the river was available and purchased from a George Pennimen. Because funds for the construction of the new clubhouse were needed, the club sold the land on a warranty deed to Cornelia D. Williams, who then sold it back to the club on a land contract. The recorded date was July 9, 1901. The building committee hired architect Pratt & Koepke to prepare plans for a clubhouse that would be the finest and most attractive on the Great Lakes. When an artist’s rendition of the new clubhouse appeared in the Bay City Tribune newspaper on May 5, 1904, it was highly acclaimed by the members who looked forward to the best boating season ever. The contractor, Henry Weber scheduled the completion date for July 1 and though there were some items that were incomplete, a grand opening was held on July 8. It was a beautiful Victorian style building and measured 40 by 50 feet. The two story structure had upper and lower verandahs, 12 feet wide on 3 sides of the building with the upper verandah providing great views of the boat races held in front of the club, as well as other river activity. A lounging room 21 x 47 feet on the river side of the building for social activity was adjacent to a 23 x 28 foot dining room and kitchen. There were three dormitory rooms on the first floor for members who wanted to get an early morning start for the fishing grounds. A wide open stairway on the right side of the building led to a ballroom, as well as a sail loft and women’s restroom. The original clubhouse was moved on the ice from its location at the foot of Scheurman to its new location, turned 90 degrees to the right and attached to the new clubhouse. dinghys, row boats, etc. were launched from the building and the barroom remained in this section. The new club location greatly increased the mooring area and allowed room for improvements which were to follow. The clubhouse was entered from the road across a piling supported boardwalk, approximately 10 feet wide by 400 feet long built over the swamp between the road and the entrance at the rear of the club. There were many great parties at the club and it was said that upon leaving the parties an occasional male celebrant made a detour from the boardwalk experiencing an abrupt (sobering) experience when he found himself in the swamp. The walk was especially hazardous when wet from the windswept spray during strong northerly winds that raised water levels. Until 1952 boats were moored in the river in front of the clubhouse. In 1952 a decision was made to dig a boat basin 300 feet long, 150 feet wide and 11 feet deep to the south of the clubhouse. A.J. Monahan, then the owner of a lumber company in Flint, donated lumber for the docks. The new basin afforded protection from wind and waves and was a vast improvement over mooring in the river. Plans then went forward to enlarge the south basin and dredge a second basin on the north side of the clubhouse. By the end of 1955, both basins were completed to a length of about 600 feet. It was not long before all docks were occupied! The “Old Club” served the membership well for 50+ years but by the mid 1950’s it was clear that something had to be done. The pilings it rested on had been shifted by the ice and were deteriorating. The floors were badly warped by previous flooding and the upper veranda was closed due to its poor condition. A design from Francis Warner of Midland was accepted and Gregory Construction of Bay City hired. The construction was completed in time for the grand opening to coincide with the Commodores’ Ball on May 7, 1960. The completion of the building created a burst of activity by various committees. Because it was now adequately heated, the club could be opened earlier in the year and continue in operation until after the New Year’s Eve party. Originally, the small dining room area on the west side of the building was a screen porch which diminished its utility and increased its maintenance costs. The screen was soon replaced with large windows. Still referred to as “the porch”, it was not heated until 1978. In 1971-72 after a Club fund raising, the bar and Commodores’ Lounge was refurbished. The lounge was officially dedicated to all past Commodores in the name of Past Commodore Floyd Nichols at the Commodores’ Ball 1972. By 1971 soil erosion along the banks of both North and South basins was so extensive that some docks had to be propped or extended at the shoreline for support. A great deal of soil had been washed out from the wooden seawall. After considerable debate and planning, a seawall project was initiated and completed by May 1972. All docks were immediately filled, with a waiting list by the end of 1972! 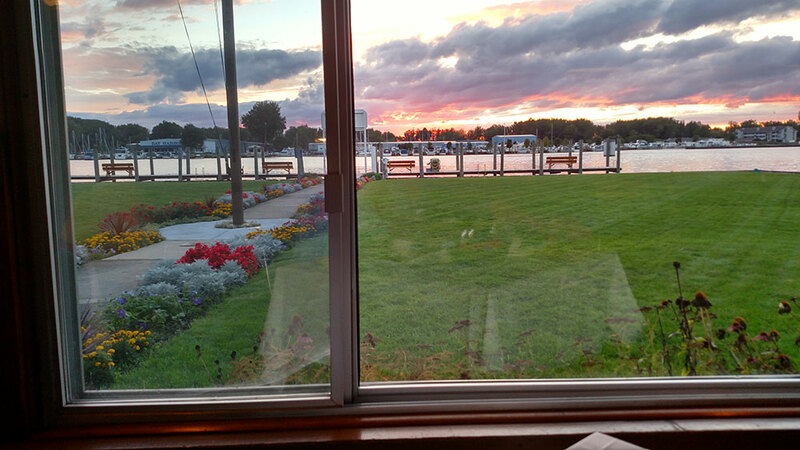 With a typical high degree of camaraderie, love of boating, and desire to add to the great accomplishments in the past, SBYC members have continued to make many additions and improvements. In 1981 a large shower and restroom facility was constructed behind the east side of the clubhouse. In 1984, a 21 foot addition to the bar room was completed which is still called “the new addition” to this day. This addition very much increased the utility of not only the bar but the Commodores’ Lounge. In 1995, a new two story maintenance barn was built by the membership under the direction of long time member Lyn Detzler. In 2000 the front seawall was replaced with a steel seawall. In 2001, a beautiful brick patio, financed by selling personalized, engraved bricks, was built by the membership under the expert direction of club members Jerry Somalski and Tom Greenia. Finally, in 2002 all new electrical and water service to the docks was installed as a labor of love by many Club members. As we write this history in 2009, plans are being drawn up for significant improvements in the shower house, clubhouse heating/air conditioning and expansive windows. Each generation of SBYC members steps up to the challenge of leaving the Club a better place for future members to enjoy regardless whether they are boaters or boatless. 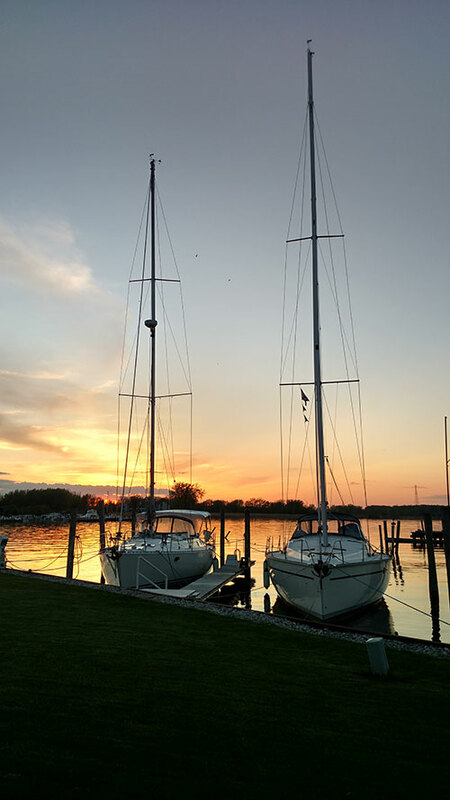 The Saginaw Bay Yacht Club is and has been a place where people from all walks of life can meet, socialize and enjoy the beautiful view of boats of all kinds travelling up and down the Saginaw River.